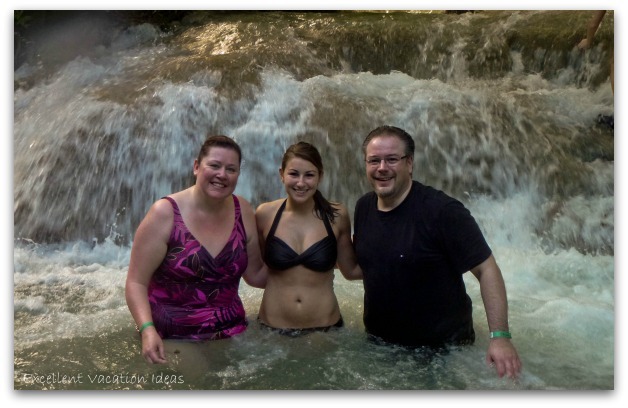 Dunns River Falls Jamaica - Check out our adventure at Dunns River Falls in Ochos Rios! 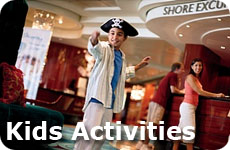 On a cruise on board the NCL Pearl, one of our port of calls was Ochos Rios Jamaica. Dunn Rivers Falls was a "must see" for us at this port of call. 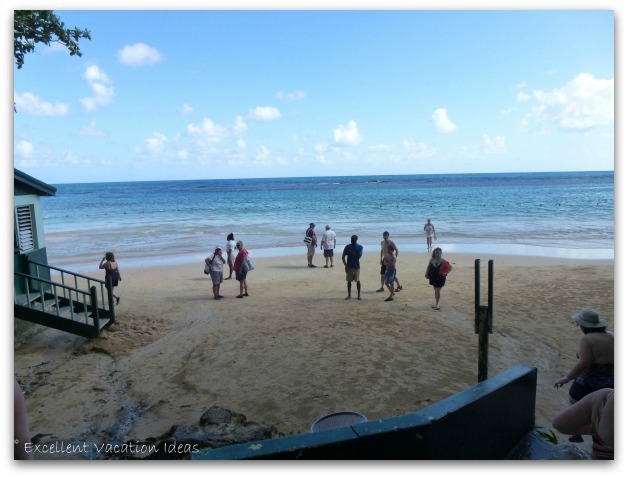 We had a great time at Dunns River Falls – with one minor hitch. Well, for Warren, it was kind of a major hitch, but I’ll get to that in a minute. 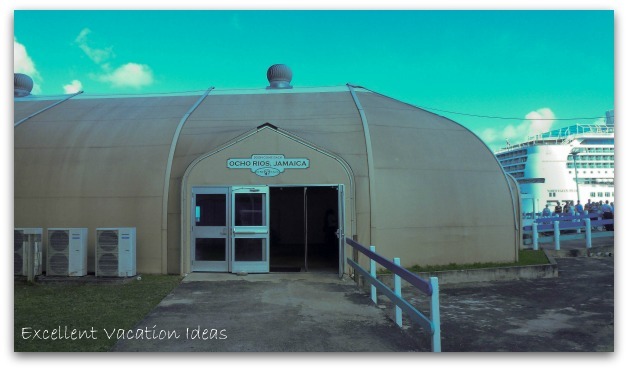 We decided to do a tour with a local company Peat Taylor Tours. We had used them before, back in 2001 when Warren and I climbed the falls then. Montana had never climbed Dunns River Falls and she was looking forward to it. 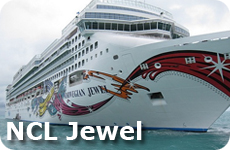 After we disembarked from the NCL Pearl, we went to find the tour company. What I love about Peat Taylor Tours that they’re small tours, we had only two families on this tour, so we were seven total. After meeting a tour rep at the end of the cruise dock, we were introduced to our driver, Anthony Henry. 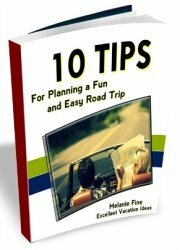 We got in the car and off we went to the Dunns River falls Jamaica. When we arrived weren’t very many cars there, which was amazing as that meant that we beat the rush. On route he gave us quite a few opportunities to purchase water shoes. You cannot do this excursion without water shoes. 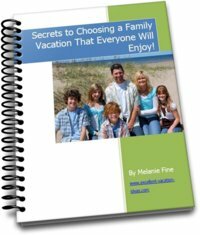 We already had water shoes, as did the other family so we thought we were all set. A great bonus with Peat Taylor Tours is that he allowed us to leave everything in his van, we didn’t have to bring any of our valuables or stuff with us. In fact, all we brought was ourselves, our water shoes and cameras. Next, we were guided to the front gate where we got our wristband, and then taken all the way down the hill - almost to the bottom, where we met up with our guide. 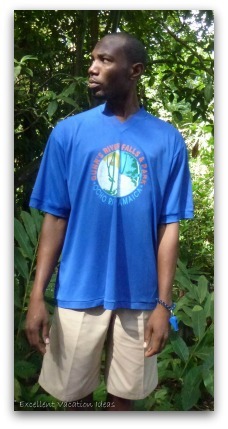 You can only climb the Dunns River Falls with a guide. Our guide’s name was Morris. He started off by telling us what to expect, which was that we would all be holding hands going up the falls and that we would be helping each other. He also said that we had to have the water shoes, which we already knew, and then we followed him down to the bottom. When we got to the bottom, we saw the beautiful beach. 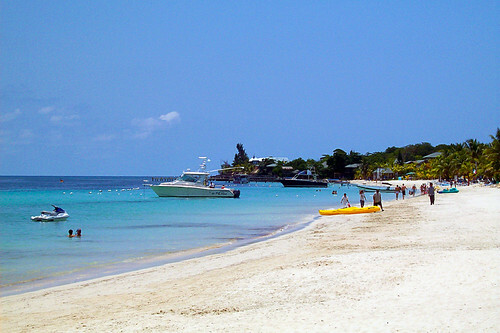 I can see why some people choose to spend the day at Dunns River Falls Jamaica and just hang out at the beach after they climb the falls. The only thing that would bother me is the thousands of people arriving to climb the Falls. Our group of about twenty or so got ready to start climbing the falls. Silly me, I didn't bring a waterproof camera, so we had to use my regular camera. Unfortunately, that meant that I couldn’t carry it and I couldn’t get a lot of pictures. But Morris was more than happy to take some pictures of us and to try to protect my camera. The water was cold, but it wasn’t too cold and we got used to it really quickly. We were surprised at how many people were here already. Even though we arrived early, it did seem like there were still a lot of people. Apparently later in the day, though, there were about three or four times the amount of people climbing the falls at any one time. This is definitely a tour where you can expect to get wet. As we started climbing up, we realized that this wasn’t necessarily easy, but it wasn’t really all that hard, either. It was just a lot of… climbing. Warren, who’s not a fan of water, was actually enjoying himself. 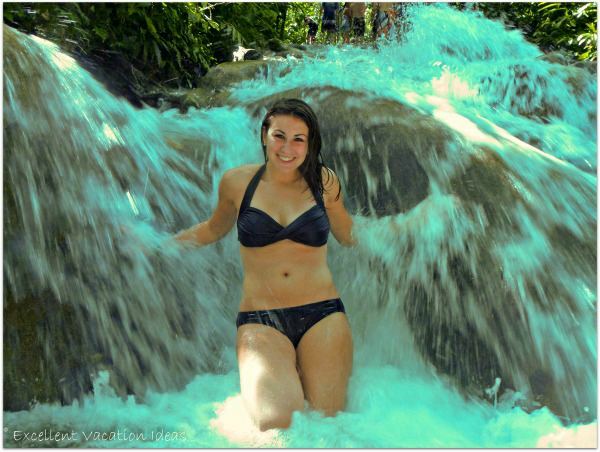 There were some great opportunities for some great photographs of Dunns River Falls Jamaica. About a third of the way up, however, everything went wrong for Warren. The water shoes that we chose to wear were from ten years ago. Apparently, ten year old water shoes don’t like going back in the water after all that time, and the glue failed and his shoe broke off. We got about a third of the way up the falls and he realized that he’d really hurt his toe. He must have sliced it on a rock or something. So as soon as we saw the first exit, we got out to take a look. Unfortunately, I had to hold up our group so we could take a look at Warren’s toe. By this point my shoes had broken, too, but not the same way as Warren’s had. He had actually lost both of his shoes and we weren’t sure where they went. We called over Morris and asked him to call first aid. They actually sent an ambulance down to pick him up because Warren couldn’t walk, and he especially couldn't walk up the hill. He had sliced a big piece of skin off of the top of his toe and, at one point, we thought his toe might be broken. Thankfully, it wasn't. I asked Warren if he wanted me to come with him up to the first aid station, but I really wanted Montana to be able to finish the climb of Dunns River Falls. So he said he would go up on his own and that we could meet him there at the end. Montana and I continued to do another third up and we had a blast as we climbed the falls. By the time we got to the next exit I was getting more concerned about Warren, so the family that we were with on the tour said that they would take Montana up the rest of the way on the falls. I got out at the next exit and went to see Warren. By the time I got to the first aid station they had already cut off the skin and they had really patched him up well. All we had to do now was wait for our driver to come back and get us (so I could get some shoes for Warren) and for Montana to finish the falls. I must say, the first aid station did a really great job. They said they get about 10 to 30 injuries a day for the 3,000 people that climb the falls. Really, that’s not a bad statistic. They have seen everything from dislocated fingers to cuts and bruises to broken bones. The first aid station was really professional and we were happy with how it all went. Warren even went to the doctor on the ship and the doctor said that there was nothing more to do and that the nurses had done a great job. Don't let Warren's injury stop you though, it really is a fun excursion and climbing Dunns River Falls Jamaica is worth doing! Just make sure you have good water shoes! Warren waited at the first aid station while I went to find Montana and to go and find Anthony Henry to get Warren’s shoes off the bus. They were kind enough to wait for us as I went and got his shoes and brought them back down to him. Warren knew he wanted to go back to the ship so he hobbled back up to the bus. Montana and I decided to go tubing with the other family. The tubing was a lot of fun; it just wasn’t very rapidy, if that’s a word. There were no rapids, in fact. But the water was refreshing and it was beautiful, and our guide brought his two dogs along, which made it much more entertaining. The dogs actually ran along the side with us and then they also jumped into the water and jumped up on Montana for a little bit of it. So all in all, our day in Jamaica was a good day, with the exception of poor old Warren. He couldn’t go in the water again for the rest of the week, he even missed seeing the Sting Rays in Grand Cayman, but at least it is all healed now, so that’s all that matters. 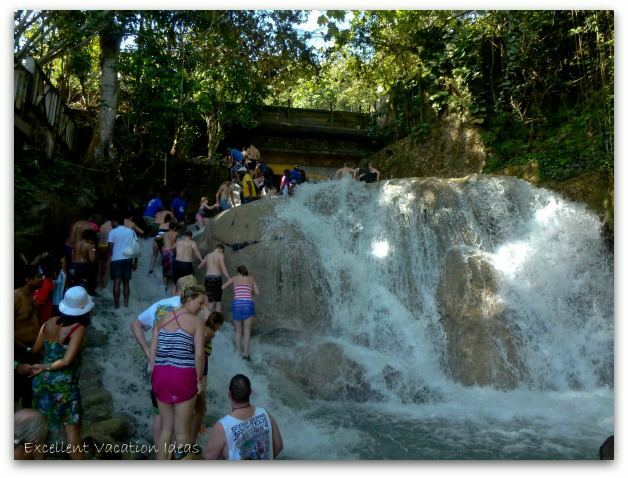 Don't forget to check out our tips and tricks for visiting Dunns River Falls in Jamaica. 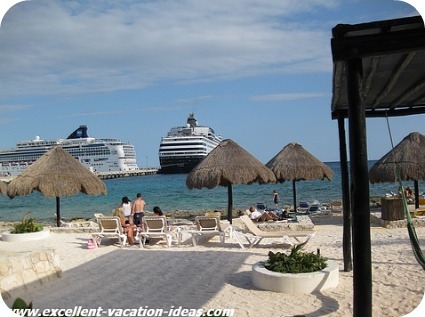 Another great and cruise oriented port of call for a Western Caribbean itinerary. Spend the day at the port that caters to cruise passengers, go to a quiet and secluded beach, go ATVing or check out some Mayan Ruins.